It is the day established by the United Nations commemorating the 1960 massacre of 69 people, engaged in peaceful protest, by police in Sharpeville, South Africa, during the historic fight against apartheid. The fight against racial discrimination, against racism in all of its forms, continues throughout the world, and our fight for racial justice, for the human rights of all migrants, regardless of migration status, is linked to all of these struggles. "...Putting an end to racial profiling by law enforcement agents is just as urgent as putting an end to violent hate crimes perpetrated by private actors. Denouncing xenophobic Muslim bans implemented through immigration policies that rely on offensive and flawed assumptions about entire religious groups, is just as urgent as denouncing explicit Islamophobic or anti-Semitic statements made by political leaders. Putting an end to the forced displacement and cultural extinction of racial, ethnic, religious and linguistic minorities and indigenous peoples that results from government--and multinational corporation--driven extraction and construction projects, is just as urgent as addressing the resurgence of neo-Nazism. 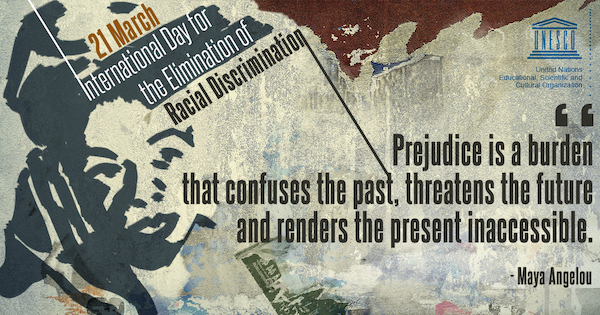 There should be no compromises in the pursuit of racial equality today..."
Click here for the Anti-Racism Day Toolkit from OHCHR. 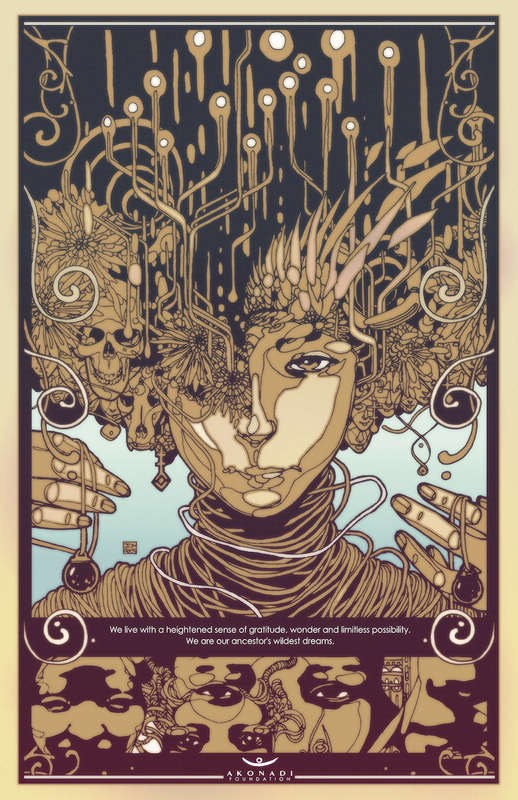 We are also proud to share here the beautiful poster, "Transmission: Received" from the artist Joshua Mays, who was commissioned by the Oakland-based Akonadi Foundation for its annual Racial Justice Poster Project. The poster was released today, also marking Akonadi's 10 year anniversary of lifting up art and culture to advance racial justice. "The keys for humanity to master the vast challenges at hand lie in its own cultural diversity. Racial and social inequity are distractions to us harvesting possibility from our struggles and our visions. Utilizing gratitude derived from ancestral perspective, we can each fill our short stay in this lifetime with transition, meaning and peace." To download Joshua's poster or to order copies, please visit Akonadi Foundation here. Stay tuned for a round-up of the many critical issues in front of the immigrant rights movement, and an update on the important negotiations underway at the United Nations for the Global Compact for Migration. Thanks as always, for your support!